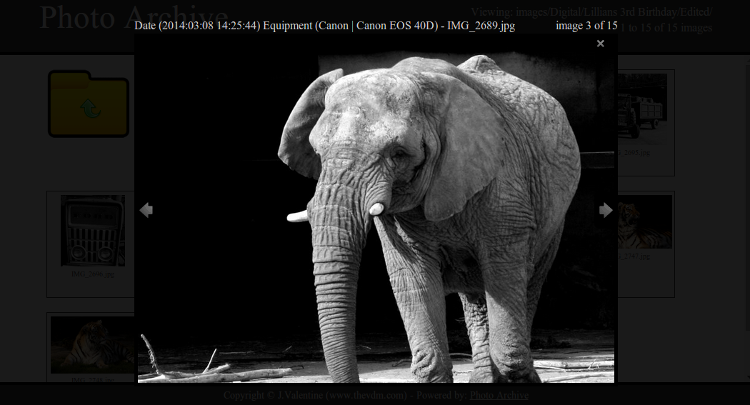 Photo Archive is a PHP based script that can generate a file browser style environment within a web browser for viewing photos on a web server. 1) Upload the contents of the zip file to the desired location on your web server. 2) Upload your images or folders of images to the ‘images/’ directory. 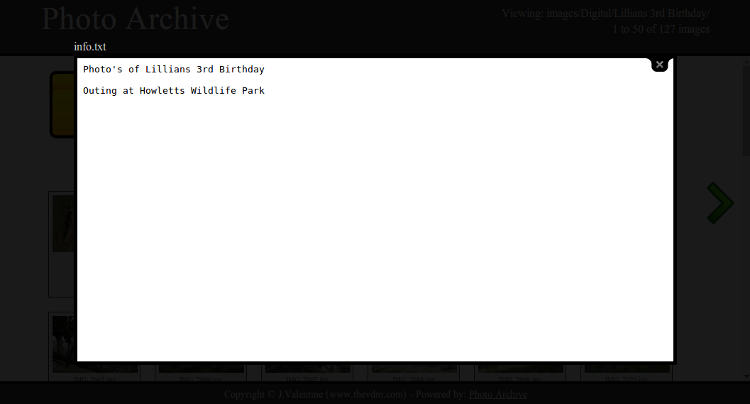 3) Open a web browser and go to the location of the ‘Photo Archive’ ript, browse & enjoy. Added code to automatically generate thumbnails for each image when users view a gallery. When viewing galleries with more than one page the arrow keys and B (back)/N (next) keys have been bound to changing page. Information txt links have been moved to show after the list of subdirectories giving a more streamlined appearance. When viewing galleries with more than one page the previous and next buttons have been enlarged to the full height of the contents div along with being given a pastel background. Replaced lightbox with colorbox due to it’s ability to display a wider range of content and smaller size. Added a preview of the contents of each folder on hover. Added the ability to read .txt files to allow users to include an information file within each folder. This software is provided free of charge without any warranty. We appreciate the ‘Powered by’ section of the footer being left intact. Excellent your code, but I have a doubt as would to sort images by creation date … ??? At present there is no option to sort the photos by date, although this would be possible to do by accessing the EXIF data and could be included in a later release. I will see if I can find some time to include this option soon. Hi Jim, would be great if you help me with that, I love your script because, unlike others, this tumbs created as load, does not create together. Thank you very much for the help Jim, I appreciate what you can do for me. Really nice work. Any idea how I can change the size of the pic when I click on a tumb? The png are smaller as the pics Oo…! Any plan for a responsive design?